Halloween is getting closer so it was a time for the monster-making workshop! It was a lot of fun! 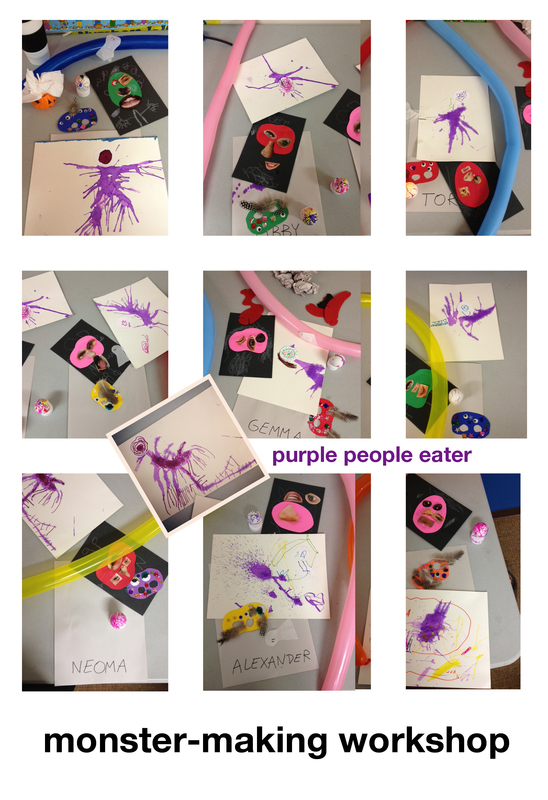 We created so many monsters that I cannot even list them all here… we use purple watercolors and straws to create purple people eaters, eyes, noses and mouths from magazines to create collages of you spooky monsters, we made monster puppets and cookies. We also played some games. We carried big, fat spiders on the spoons, we threw flies into the (masking tape) spider web and we used balloons and static electricity to make our tissue-paper ghosts fly! We danced and snacked, listened to a story… and all of that in hour and a half. I would just like to know if the kids were as tired as me! Probably not! This entry was posted in Art Projects and tagged art, ArTree, craft, Halloween, magazine, monster, party. Bookmark the permalink.